tags: Garden Skink, Lamproholis sp. One of the dangers of watching and more-so writing about nature is that one can tend to anthropomorphise what we see i.e. assign human characteristics and behaviours to the actions of animals. Doing so however can sometimes make a good story. 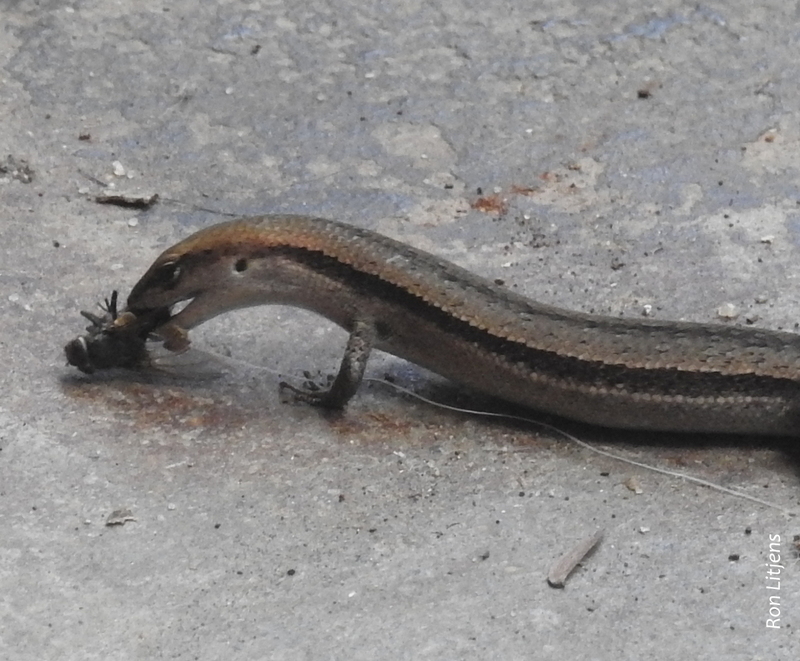 Our property is populated by Garden Skinks (Lamproholis sp. ), pictured left. Watering the veggie patch results in a stampede of the little critters from underneath the straw mulch. We even have a few that slip in and out under the patio doors and live inside the house. Skinks are one of the five broad groups of lizards, the others being Geckos, Legless Lizards, Goannas and Dragons. Only geckos have a larger number of species. Skinks are typified by a shiny, snake-like appearance and include not only Garden Skinks but also larger lizards such as Blue-tongues. In Australia there are 11 species of Garden Skinks. They are found in eastern and south-eastern Australia. Garden Skinks feed on small invertebrates such as insects and spiders. The ones in our house patrol the window ledges for flies and other insects trapped in the house behind the glass. They also make a meal of the plentiful Daddy Long-legs (Pholcus sp.) who set up their webs in the same location hunting the same food. 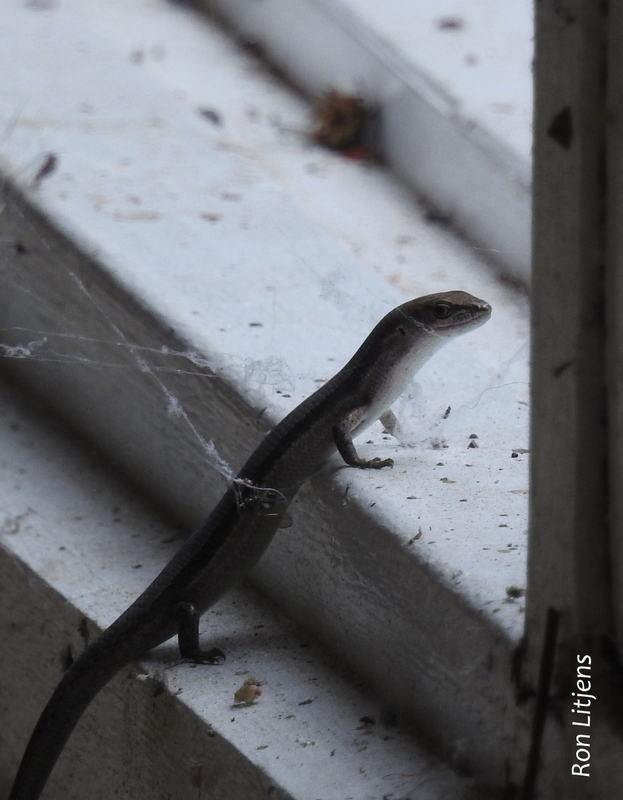 Last week whilst being entertained by one of our resident skinks devouring a fly, we noticed it stopped eating and raced to the window looking out. 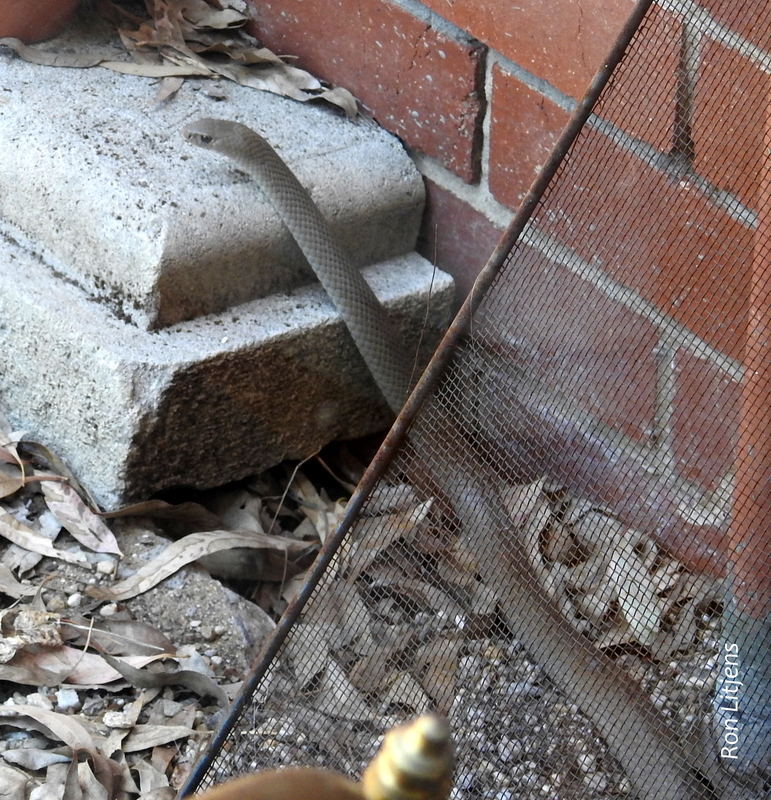 Sliding past was an Eastern Brown Snake (Pseudonaja textilis), pictured above right, another one of our reptile neighbours. Now I might be anthropomorphising but tell me it’s not checking that the coast is clear. Ron, I think checking a predator is a trait that all us creatures share, and since the dawn of existence. The question is, did it know it was safe behind the glass?